In addition to financial factors, ecological and social factors are integral to responsible action in the Schaeffler Group. The Schaeffler Group defines the framework for implementing sustainability in the company through its Sustainability Strategy “Responsibility for tomorrow.” The company bases this strategy on the 17 “Sustainable Development Goals” (SDGs) of the United Nations. The Sustainability Strategy “Responsibility for tomorrow” is based on the vision and mission of the Schaeffler Group and serves to secure and promote the long-term value of the company through value-driven corporate management. The strategy is managed and implemented by a Sustainability Governance structure that is integrated into the company’s divisions, functions and regions. 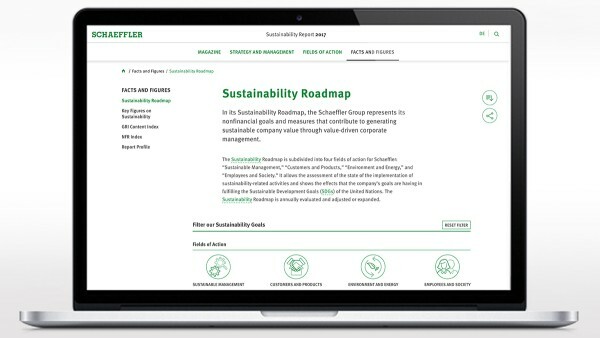 In this effort, the central management tool for sustainability activities is the Schaeffler Group’s Sustainability Roadmap. Sustainable, innovative, excellent and passionate – these are the four fundamental values that connect the 90,000 employees of the Schaeffler Group worldwide. These values guide how we work together with our customers, business partners and each other. 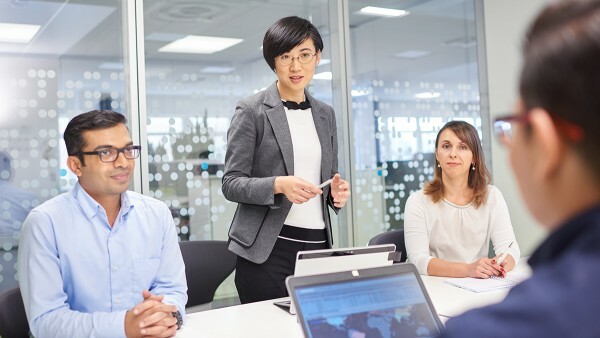 To aid that process, the Schaeffler Group’s Code of Conduct describes the basic principles and practices that should be followed by employees and business partners. 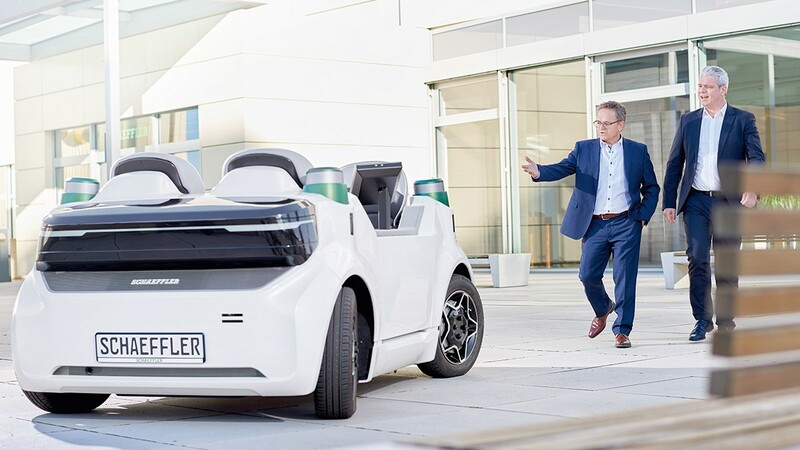 “As a leader in technology, we combine a passion for innovation with the highest standards of quality to shape the future of mobility – for a world that will be cleaner, safer and smarter.” In order to fulfill this vision, the Schaeffler Group relies on both financial and nonfinancial value drivers. The spectrum of Schaeffler’s work in sustainability consists of 24 topics. These are classified into four fields of action – “Sustainable Management,” “Customers and Products,” “Environment and Energy” and “Employees and Society” – and guide how Schaeffler is meeting growing challenges all along the value chain. It is very important for the success of the Sustainability Strategy “Responsibility for tomorrow” to understand the interests and expectations inside and outside the company and to consider them according to the principles of sustainable value creation. This is why the Schaeffler Group maintains regular, open exchange with its central stakeholder groups. Schaeffler Group memberships The Schaeffler Group holds memberships in a variety of organizations, such as industrial associations and special interest groups. The following is a list of organizations in which a Schaeffler representative holds a leading position, the company views the memberships as being strategic, takes part in projects or working groups or contributes financially beyond normal membership fees. This list primarily includes memberships relevant for the company as a whole, relevant for an industry or economic sector, or related in some way to the 24 material topics of the Schaeffler Sustainability Strategy. Moreover this compilation meets the requirement of indicator G4-16 for sustainability reporting of the Global Reporting Initiative (GRI). The Schaeffler Group is Alliance Member of the Sustainability Initiative Blue Competence. 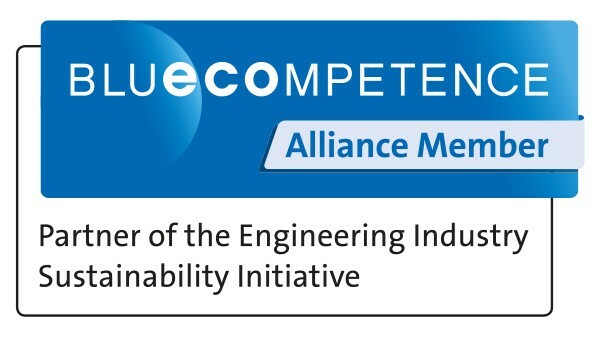 Blue Competence is an initiative of the VDMA for promoting and communication of sustainable solutions for the Mechanical Engineering Industry. By using the trademark "Blue Competence", the Schaeffler Group commits itself to the twelve Sustainability Guidelines of the Mechanical Engineering Industry. The Schaeffler Group not only fulfills our obligations related to “diversity” within the company, but also affirms our commitment to these issues externally as well. Schaeffler has pledged to uphold the standards of the Charta der Vielfalt (Diversity Charta), thereby establishing a corporate culture based on integration and mutual respect. We signaled this commitment by signing the “Charta der Vielfalt,” an initiative to advance corporate diversity, in May of 2008.
econsense - Forum für Nachhaltige Entwicklung der Deutschen Wirtschaft e.V. (Forum for Sustainable German Economic Development) is a collaboration between leading global companies and organizations within the German economy focused on issues of sustainable development and corporate social responsibility. The corporate network was founded in 2000 as an initiative of the Bundesverbandes der Deutschen Industrie e.V. (BDI - Federation of German Industries), and serves as a think tank and platform for dialog. The Schaeffler Group has been involved since 2016, one of over 30 member companies from a wide range of sectors. The goal of econsense is to drive forward sustainable development in the economy, and to take on social responsibility together. Wettbewerbszentrale – Zentrale zur Bekämpfung unlauteren Wettbewerbs e. V.
Forschungsvereinigung Smart Engineering e. V.
Arbeitsgemeinschaft der Metallindustrie von Wuppertal und Niederberg e. V.
HESSENMETALL Verband der Metall- und Elektro-Unternehmen Hessen e. V.
Unternehmerverband der Metallindustrie Ostwestfalen Bielefeld - Herford - Minden e. V.